Manapouri Motels & Holiday Park has been run by the Nicholson family since they immigrated to New Zealand from the U.S.A in 1970. In 1966 the Nicholsons travelled to Belgium where they bought a brand new VW Combi, the first Wolfsburg camper, in which the family travelled through Europe – and fell in love with the scenery and the architecture. At the end of that trip they shipped their new friend the VW camper home to San Francisco, and four years later used it as a shipping container into which they packed their worldly goods for the voyage to New Zealand. Having been told the best scenery was in the South Island they headed south in the trusty VW Camper, and found their true home on the shores of beautiful Lake Manapouri. 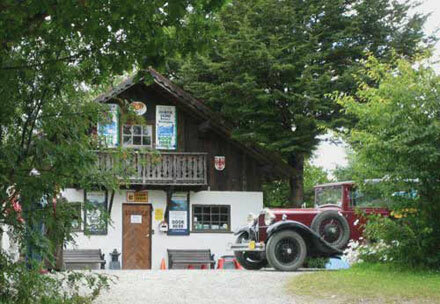 The 10 acre campground they acquired soon expanded to include Motels, the style of which harked back to those happy days travelling through Austria, Bavaria and Switzerland. A propensity for collecting saw Morris Minors popping up like so many mushrooms. Exotic trees and pinball machines gradually multiplied. 40+ years on, what keeps Joelle Nicholson in this business is the great enjoyment she finds in chatting with people from all over the world and sharing with them what her family have discovered and created in this rather special corner of the world. 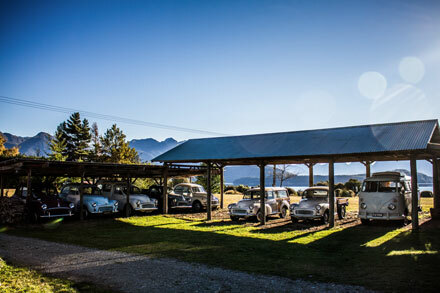 We are located on the boundary of the small township of Manapouri, overlooking the breathtakingly beautiful panorama of the lake set against a backdrop of majestic mountains. What a sight to wake up to! Manapouri is a great base from which to explore the Fiordland National Park and we can assist you with booking Fiordland cruises and excursions. The departure point for all Doubtful Sound Cruises is only a pleasant 15min walk from us, or you can be collected for free from our doorstep. A short stroll away are restaurants and a pub. Walking tracks and a pristine lake provide recreational opportunities such as tramping, kayaking, swimming, fishing and guided sightseeing. And when you get home to Manapouri Motels & Holiday Park you might like a game of pinball or table tennis.